In this update you can organize questions in your surveys across multiple pages. Pages are particularly useful when working on very large forms, helping you logically organize your questions and giving end users a sense of progress across the entire survey. In the example above, I added a welcome image and text on the first page to create a cover for my survey. Note that the first page does not expect any input from the survey. It is just a welcoming page, or cover. Next, I organized the actual questions within my form into pages, giving each page a descriptive title at the top. As users move from page to page, a progress bar at the bottom shows how close they are to the end of the survey. Tip: You can combine groups and pages to further help organize questions within your survey! If you use web designer to create your surveys, you will find that we have added a Page option in the main panel. Just like you do with other question types, simply click on Page, and it will be added to your form. You will be able to drag and drop questions into your new page, move questions from one page to another and even merge and duplicate pages! First, in the settings worksheet of your XLSForm, you will set the value of the style column to pages. Then, in the survey worksheet, you will use the field-list appearance for any XLSForm begin_group question type that you want to turn into a page. Also note that when using the pages style, pages will be automatically created for any question outside field-list groups. You can now embed public web forms in your own web site. As shown below, the Collaborate tab of your survey will now include an Embed option from which you can copy the HTML code needed to embed your survey within a web site. A handful of embed options let you quickly configure your embed HTML code to hide elements of your survey that you may want to hide, such as the header, sign-in, multiple language options, footer, etc. You can even disable the theme colors to provide a more neutral presence of your embedded survey within the web site. The Survey123 website includes a number of reporting capabilities to help you understand data captured through your surveys. The Analyze page, for example, aggregates responses for categorical, date and number questions and creates charts and maps to more quickly identify trends on your data. Questions with free text are always trickier to aggregate, but that is where word clouds come to help. A word cloud takes the most common words found in your data and sizes them according to popularity. The bigger the word, the more repetitions. It is a simple concept but it often gives great insight. Unfortunately, the most common words in our language are far from interesting in this context. Think about it: this, that, of, a… all pretty useless stuff in a word cloud, don’t you think? These words are known as stop-words, and now you can set a filter to ignore them (at this moment, only in English). In this particular scenario, the survey asked people in the city ‘What are your thoughts on how can we better educate drivers to pay attention?’. The most popular words among the responses are ‘the‘, ‘and‘, ‘to‘ and ‘of‘, but if we apply the stop word filter, much more relevant words will come out: speed, signs and people. With stop word filters you can more easily understand certain relevant trends in your data. We introduced Custom Themes not long ago. Definitely a good addition to give your surveys a nice final touch! If you haven’t already, I highly recommend you watch this video-tutorial or read the Introducing Custom Themes blog post. In this update 6 new theme templates have been added. 5 of them will help you quickly switch through different color combinations. You can also make tweaks in them, of course, but they provide a nice start. The sixth template is more interesting, in that it will mirror the Shared Theme of your ArcGIS organization. If you are not familiar with this concept of Shared Theme, have a look at Ian’s blog post Introducing Shared Theme: a new app styling capability in ArcGIS Online. The Shared Theme is set by the administrator of an ArcGIS Organization defining the basics for styling configurable apps in it: text and background color, etc. Now, you can easily match that style! BUG-000112899 Publishing a survey on survey123.arcgis.com connected to a Portal for ArcGIS using Integrated Windows Authentication (IWA) returns the error message, “Unable to publish the survey. Unexpected token < in JSON at position 0”. BUG-000116898 Renaming the survey under ‘Edit Survey Info’ in survey123.arcgis.com will cause the feature service to change the name from _fieldworker to _stakeholder. BUG-000117623 When survey123.arcgis.com is accessed via Portal and only one record is present in the service, the default extent and zoom level configured on the survey are not honored when viewing from the Data tab. BUG-000116269 When printing a web map in a custom report from the Survey123 for ArcGIS website, at least one element of the web map must be public, otherwise the error message, “An error occurred while generating report(s)” is returned. BUG-000117239 Survey123 does not honor survey’s viewer collaboration with a group in ArcGIS Online if the survey has been authored through Survey123 Connect using an ArcGIS Server secured feature service added to ArcGIS Online as item with Credentials stored. BUG-000116800 Reports generated from the Survey123 for ArcGIS website show the Object ID as a date. BUG-000116268 When printing custom reports from survey123.arcgis.com, the web map in the report fails to display all layers in the map. BUG-000118284 In Survey123 for ArcGIS, the map scale setting is not honored when including a map in a report. BUG-000118703 Surveys with calculate type questions that use pulldata() on a geopoint question within an if statement display the error “Error: Initialing Form… FormLogicError: pulldata with incorrect number of parameters found: pulldata(‘@geopoint’, // , ”)” and load without form logic when opened in the Survey123 Web App. Custom Reports can now access all fields within the underlying feature service. Custom Report syntax in Microsoft Word documents is now checked immediately after uploading the template. Added support for the XLSForm function @property in Web Forms. 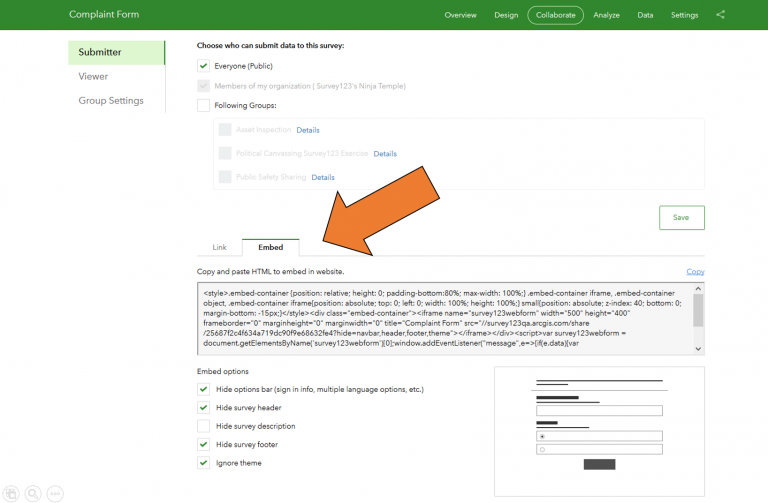 Survey123 Connect will no longer overwrite survey settings (such as web hook configurations) updated through the Survey123 website. BUG-000111392 Survey123 Connect installed on a Windows 2012 R2 machine crashes when publishing a survey to Portal for ArcGIS 10.5.1 configured with enterprise logins. BUG-000119026 Delete refresh token stored in SecureStorage if auto login fails with invalid refreshtoken error. BUG-000097165 – Copy images used for form background into the media folder. Various fixes affecting repeats and nested repeats (BUG-000117852, BUG-000117987, BUG-000118094, BUG-000118449 and many others). BUG-000117852 : Surveys for geopoint, picture and select one questions are not displayed for the second and subsequent repeat questions/related tables in sent folder if those questions are relevant questions. BUG-000117987 : Calculation fields fails to retain submitted values in Inbox if the field are part of “Repeats”. BUG-000118094 Relevancy questions within repeats do not save the information when the survey is saved as a draft. BUG-000118449 : When including a signature field in a relevancy controlled group within a repeat in Survey123 Connect, the first signature entered is not displayed in the outbox (drafts). BUG-000117493 “SSL Handshake failed (6)” error is generated in Survey123 app when using Android 7.0 or higher and using non-CA certificates for Portal. BUG-000110786 – Survey123 cannot change from an Windows Authentication (IWA) portal to another. BUG-000113293, BUG-000113294 – User signed out when losing network connection. BUG-000098854: Survey123 App Portal cannot be added after tapping “Add Portal” in Windows Mobile. BUG-000118375 Mathematical calculations from Inbox do not trigger when NaN or null values are used. BUG-000106578, BUG-000112873 – When choice_filter used, the name text is saved as the data value, instead of the label text. ENH-000109073 – Include a comma (thousands separator) in decimal questions. Various bug fixes for localization issues. For more details on the 3.2 release, check out our What’s New Help Topic, which also includes an archive of all new features added in previous releases.